My obsession with green chiles is probably old news to you by now, but I just love the flavor and mild heat they add to a recipe. If you haven’t used them and are scared off my the word “chile,” don’t be! They aren’t very spicy at all and they add amazing flavor to recipes. I especially love them in creamy, cheesy recipes like my green chile mac and cheese. If you’re still feeling skittish about the chiles, you may leave them out of this recipe and it will still taste fantastic. However, I’d encourage you to give them a try! 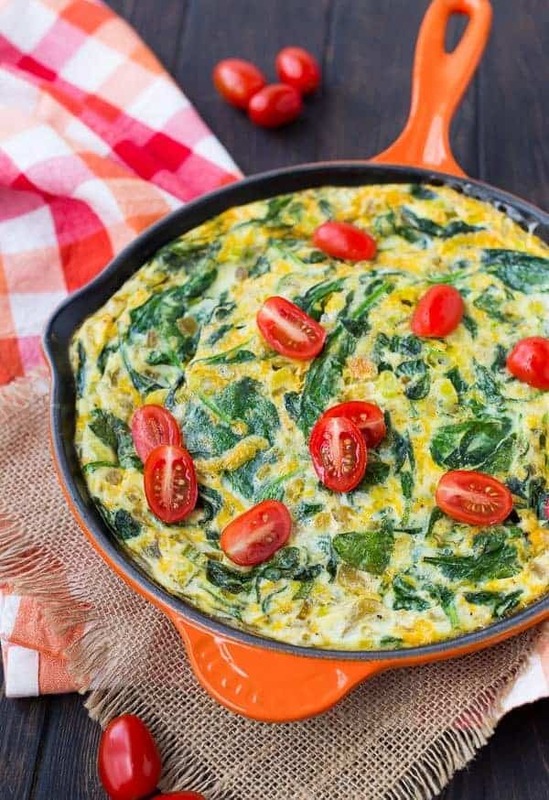 Tip: Don’t feel like making a whole frittata? 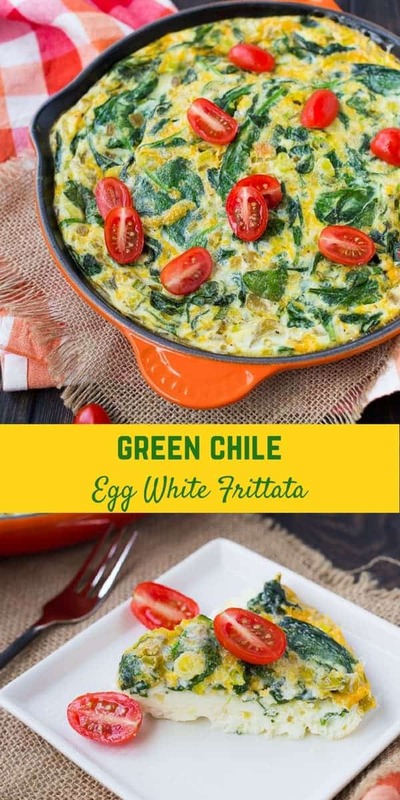 I love to keep green chiles in the fridge to make a quick egg white omelet with. They add such fantastic flavor! 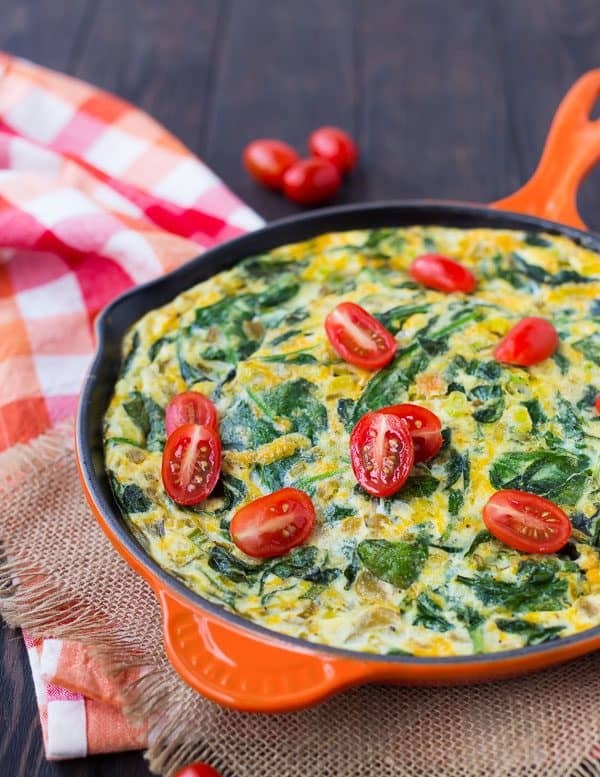 This easy egg white frittata is packed full with nutritious spinach and has lots of flavor thanks to the green chiles and green onions. Tip: Did you know you can freeze green onions? I often buy them to garnish a southwestern recipe or chili and don’t use them all. I slice them and throw them in a freezer bag and then I use them in my eggs or stir-fry recipes. They’re great in fried rice or cauliflower rice, too! I used two kinds of cheese in this frittata – cottage cheese and cheddar cheese. The cottage cheese adds creaminess and tons of protein. The cheddar cheese adds the great flavor that you crave from cheese. I like to use the sharpest cheddar I can get my hands on! 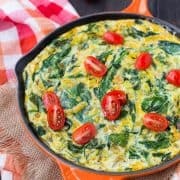 This frittata reheats well in the microwave if you want to make it ahead and have it available for quick and easy weekday breakfasts. In an oven-safe skillet, sauté vegetables until nice and soft! In a bowl, whisk together eggs and cheese. Pour over vegetables and stir to combine. Move to a preheated oven and bake until eggs are set in the center. PS: Love my skillet? It’s this one. In an oven-safe skillet, heat butter medium heat. Add green onions, green chiles, and saute until green onions are softened (1-2 minute). Add spinach and stir and continue to cook until wilted, about 3-4 minutes. If you have a cover, you can cover for 1-2 minutes to speed the process of wilting the spinach. Add salt and pepper to taste, keeping in mind that the cheese will add saltiness. Move to preheated oven and bake for 35-40 minutes or until eggs are set. Cool slightly before slicing into wedges and serving. 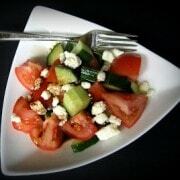 I love serving this with fresh fruit or a side of fresh tomatoes tossed with olive oil, salt and pepper. 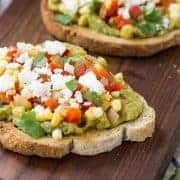 The tomatoes are great with avocados added in, too! It’s really low-calorie so it would also be great with some roasted potatoes or a slice of whole-grain toast. If you’re making this ahead, store slices in an airtight container. If you have more than one layer, place parchment paper between the layers. This will also help if there is excess moisture. 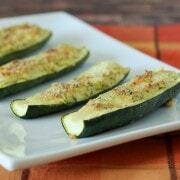 You could make this Whole30 by omitting the cheese. 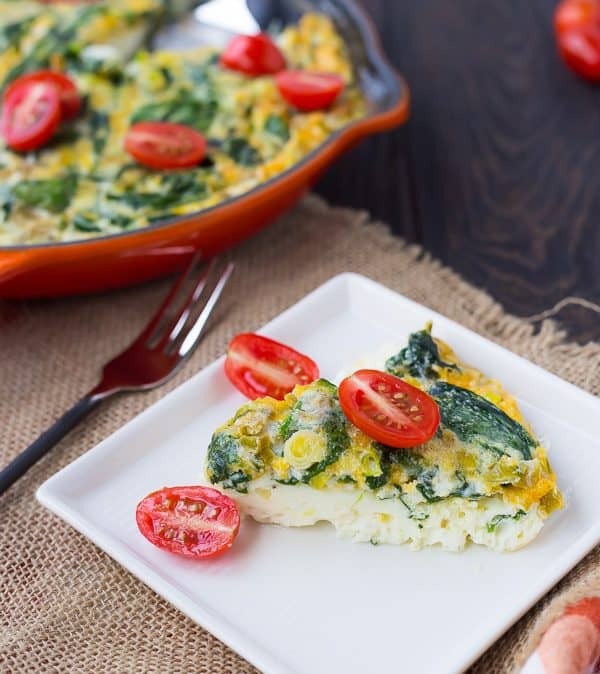 Verdict: This is one of my favorite egg white frittata recipes! Husband’s take: Ben loved this one too! Changes I would make: None are necessary but if you have a different vegetable or green on hand, feel free to give it a try! Me too! :) You’re welcome! That looks delicious! 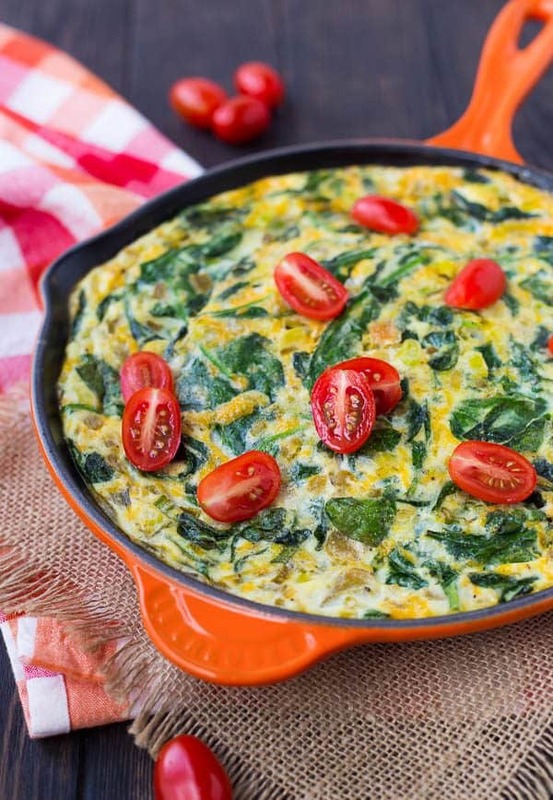 Thanks for the shout-out for my Spinach and Mozzarella Egg Bake! Thank you – and you’re welcome!